If you strip a datacentre right down to the basics what is it? A secure, managed and controlled environment for IT operations based on a grid-square map. Within a well-planned datacentre, every aspect of the white space is grid-reference and planned according to floor space and tiles. Fast growth datacentres need to be able to respond to client demands and quickly. This can often mean plugging in and commissioning new racks and servers within days of a new client sign up or contract expansion. All fairly easy to project manage if the power and cooling has also been designed for ease of expansion. In most instances the cooling systems have been designed to cater for expansion, with arrangements made to ‘plumb-in’ additional air handlers, CRACs and heat exchangers. When it comes to power this is not always the case and perhaps this is a legacy issue. The power into a datacentre will always be constrained and set by the building incomer. What happens inside is very much up to the facilities and datacentre managers who have to make sure they stay within the limitations of what the building supply can deliver in terms of kVA/kW or MVA/MW. This approach has often led to a fixed capacity mono-block type UPS system being installed with little thought being given to future expansion other than the building-in of over capacity. This leads to increased capital expenditure on day one and increased running costs due to operating energy inefficiencies. 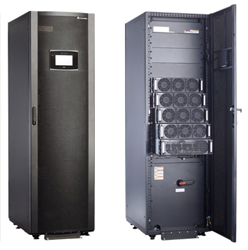 Modular UPS systems are fast developing into the latest trend within the uninterruptible power supplies industry. Modular power solves that last missing element when it comes to datacentre design and planning. It is however only a partial solution, even though a very good one. At some point the datacentre manager has to estimate their total facility power draw and with the facilities manager agree to the maximum size of UPS system required. Once established a fixed capacity mono-block or modular UPS system size can be selected and planned accordingly. Datacentre Modular UPS systems provide an easier form of expansion and day-one right-sizing but still require a frame size to be fixed. For example, if the total facility load is 280kW, a modular UPS 320kW frame could be used to house up to eight 40kW slide-in power modules. This approach can be extended with different frame sizes up to 1MW or greater. Modular UPS frames can be operated in parallel. The key point is to view the UPS frame as a piece of fixed capacity switchgear from which the datacentre is powered with energy optimized and a right-sized number of UPS power modules. Capacity expansion can then be made easily (within minutes) through the placement of additional slide-in power modules.